FULTON, Robert, inventor, born in Little Britain township (now Fulton), Lancaster County, Pennsylvania, in 1765; died in New York, 24 February 1815. His father came from Kilkenny, Ireland, early in the 18th century, and settled at Little Britain. At the age of thirteen Robert constructed paddlewheels, which he applied with success to a fishing boat. The years 1782'5 were spent in painting miniature portraits and landscapes, mechanical and architectural drawing, and whatever came in his way in the line of artistic work, at Philadelphia, where he numbered Benjamin Franklin among his friends. In 1786 Fulton went to London, and was received into the family of Benjamin West, under whose instruction he studied for several years. Afterward he practiced his art in Devonshire, under the patronage of wealthy persons, among who were the Duke of Bridgewater and Earl Stanhope. With his acquaintanceship with these persons begins his experiments in mechanics. Francis Egerton Bridgewater (last duke of that name) had become famous by the construction of a navigable canal from Worsley to Manchester, and Charles, Earl Stanhope (third of that title), was the inventor of the Stanhope printing press, and a student of mechanics and engineering. In 1798 Fulton actively engaged in a project for the improvement of canal navigation, and in the following year obtained from the British government a patent for a double inclined plane for raising or lowering boats from one level to another on a system of small canals. An account of this patent is in the "Repertory of Arts," vol. xvii. In 1794 he patented a mill for sawing marble. Some time in 1796 he made plans for the construction of cast-iron aqueducts, and a great work of this kind was built for crossing the River Dee. A bridge built upon his plans was erected at Wandsworth, and others at several points on the Surrey railway. He also patented in England a machine for spinning flax, a dredging machine, a market or passage boat, a dispatch boat, and a trader or amphibious boat to be used on canals. 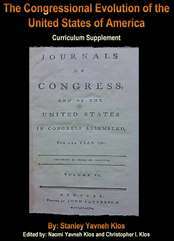 In 1796 he published his " Treatise on the Improvement of Canal Navigation," having previously published some articles on the subject in the London" Morning Star," advocating small canals. 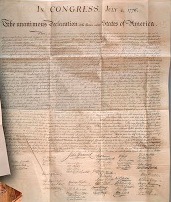 Copies were sent by the author to the president of the United States and other officials, each accompanied by a letter emphasizing the advantages to be derived by the United States from canal navigation. In 1798 he addressed letters, or rather essays, to Lord Stanhope, which were apparently intended for publication one aiming to arouse English interest in internal improvements, and the other to promote the interests of education in France. Among his manuscripts was found a work, probably written about the same time with the above, advocating free trade. In 1794 he became a member of the family of Joel Barlow, author of the " Columbiad," in Paris. Here he painted a panorama, the first ever shown in the French capital. In December 1797, Fulton made an experiment on the Seine with a boat for submarine navigation, to be used in torpedo warfare. In 1801 he conducted some experiments at Brest with his submarine or plunging boat, under the auspices of the French government, which, however, on Fulton's failure to blow up the British ships that sailed along the coast, became disaffected with the undertaking. The government of England, at the instigation of Lord Stanhope, determined to secure Fulton's services for that country, and accordingly he went to London in May 1804, after a short sojourn in Holland. The submarine boat was finally reported by the British commission to be impracticable; but the torpedo they thought of some value, and Fulton was taken out with an expedition to try it against the French fleet at Boulogne, where the torpedoes burst harmlessly beside the French ships. An experiment in October 1805, with an improved apparatus, on a brig of 200 tons, provided for the purpose by the government, resulted in the destruction of the ship. In 1806 Fulton had returned to the United States and renewed his experiments with torpedoes. His system was never adopted, though in 1810 congress appropriated $5,000 for testing the torpedoes and submarine explosions. About this period Fulton invented a machine to cut the cables of ships at anchor. In 1813 he; took out a patent for "Several Improvements in Maritime Warfare, and Means for injuring and destroying Ships and Vessels of War by igniting Gunpowder under Water." A letter from him to Jefferson, describing his submarine gunnery, was printed from his manuscript in "Scribner's Monthly," vol. xxii, with the reproduction of his rough sketches. Fulton began to turn his attention to the subject of steam navigation as early as 1793, as is shown in a letter to Lord Stanhope, dated 30 September of that year. In 1803, having the financial assistance of Chancellor Livingston, Fulton launched a steamboat on the Seine, which, owing to faulty construction of the frame, immediately sank. Another boat was soon built, with the old machinery, and a trial trip was made, but no great speed was attained. Encouraged with this partial success, Fulton shortly afterward ordered an engine of Watt & Boulton, to be sent to the United States. Early in the spring of 1807 the boat that was to navigate the Hudson and establish the system of steam navigation was completed at a shipyard on the East river. (See accompanying illustration.) The engine was put in later, and on 11 August 1807, the "Clermont" steamed up the Hudson to Albany, the voyage occupying thirty-two hours. During the autumn of 1807 the " Clermont" was run as a packet between New York and Albany. The success of Fulton's enterprise excited much jealousy and rivalry, and a number of persons disputed his claim to originality. Litigation and competition threatened to rob him of all profit from his invention. Fulton's first patent for improvements in navigation by steam was taken out on 11 February 1809, and another, with fuller provisions, on 9 February 1811. The first attempt to connect a steam engine with the screw propeller was made by Joseph Bramah, of Piccadilly, who on 9 May 1795, patented the application of a paddlewheel to the stem of a vessel, driven by a steam engine. A brief list of those who used steam on boats of any description includes Rumsey, on the Potomac, in 1785; John Fitch, first in September 1785, again in August 1787; Patrick Millar, in 1787; Nathan Read, at Danvers, in 1789. John Fitch, in 1788, built another boat, propelled by steam from Philadelphia to Burlington, twenty miles, being the longest trip ever made by a boat under steam at that time. In October 1788, Millar, Taylor, and Symington put a steamboat on Lake Dalwinston, Scotland. In 1789 a steamboat built under Fitch's directions attained a speed of eight miles an hour on the River at Philadelphia. In 1790, William Longstreet had a small boat on Savannah River; the same year Lord Stanhope patented an ambi-navigator with a propeller in the form of a duck's foot. John C. Stevens, of Hoboken, New Jersey, constructed boats sailing with a speed of five or six miles an hour. In 1794, Samuel Morey took a boat by steam from Hartford to New York City. Robert L. Stevens sailed a paddlewheel steamer on the Hudson only a few days later than Fulton's "Clermont." This boat was afterward taken by sea to Philadelphia, thus making the first steamship voyage on the ocean. Fitch and Stevens are Fulton's most formidable competitors for the honor of demonstrating the feasibility of steam navigation, although many other claimants have had partisans. So late as 1871, John H. B. Latrobe, in an address before the Maryland historical society, entitled " A Lost Chapter in the History of the Steamboat," urged the claims of Nicholas J. Roosevelt as the inventor of vertical wheels over the sides of the boat, which produced, in Fulton's hands, when propelled by steam, the first practical result. Fitch's boat was propelled by vertical paddles, and Rumsey's by the expulsion, at the stern, of water that had been drawn in at the bow; Fulton, in his Paris experiments, as set forth by Colden, his biographer, preferred endless chains with resisting boards or floats. Whatever may have been Fulton's honors as to the invention, he undoubtedly deserves the credit of first bringing into practical use the steamboat as a conveyance for passengers and freight, all earlier undertakings having been inefficient practically. The success of the "Clermont " was followed by the rapid multiplication of steamboats. A list of those built under Fulton's superintendence comprises the "Car of Neptune," the " Paragon," the " Firefly," the " Richmond," the " Washington," the " Vesuvius," the "Olive Branch," the "Emperor of Russia," and the "Chancellor Livingston," as well as several ferryboats. He described his first ferryboat in an article published in the " American Medical and Philosophical Register" for October 1812. In 1814, Fulton submitted to the coast and harbor defense committee plans for a steam warship to carry 44 guns, and in October of that year a boat of this description, called the " Demologos" (subsequently named "Fulton the First ", was successfully launched. The War of 1812 terminated before the effectiveness of the "Fulton " as a war vessel could be tested, and she afterward became a receiving ship. The last subject to which Fulton's energies were devoted was a modification of his submarine boat the "Nautilus," but only the hull of the projected craft was completed before his death. Exposure in crossing the Hudson, after testifying in New Jersey in a steamboat case, laid the foundation of Fulton's last illness. He left a widow (daughter of Walter Livingston) and one son and three daughters. ... to the TSHA home page], format this article to print. BATTISE, ROBERT FULTON (1909-1994). ... Edgar Lee Masters (1868 1950). Spoon River Anthology. ... You are the visitor. Please contact Webmasterwith any invalid links or other problems. Robert Fulton. Hey, isn't this the steamboat guy? Yeah. American Bios Logo & Link. ... Robert Fulton. by Aimee W.
Click here for the Inventor of the Week Archives! Hall. 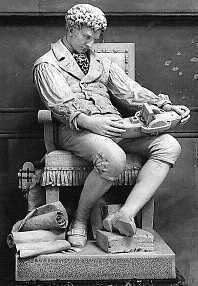 Sculptor: Howard Roberts, 1883, marble, 5' 4". Start your search on Robert Fulton.